William Kamkwamba, growing up in Malawi, tells us his story. He tells us about his family, his friends. A brief history of Malawi. When a severe drought (followed by famine) hits, this country of largely subsistence corn growers is starving. William can’t go to secondary school, although his parents try everything, because all the money that would have covered the fees were spent keeping them alive. Instead, William goes to the new library at the local primary school. He’s surprised by the wide selection of books and is drawn to the science texts, particularly physics. Taken in rural central Nebraska. 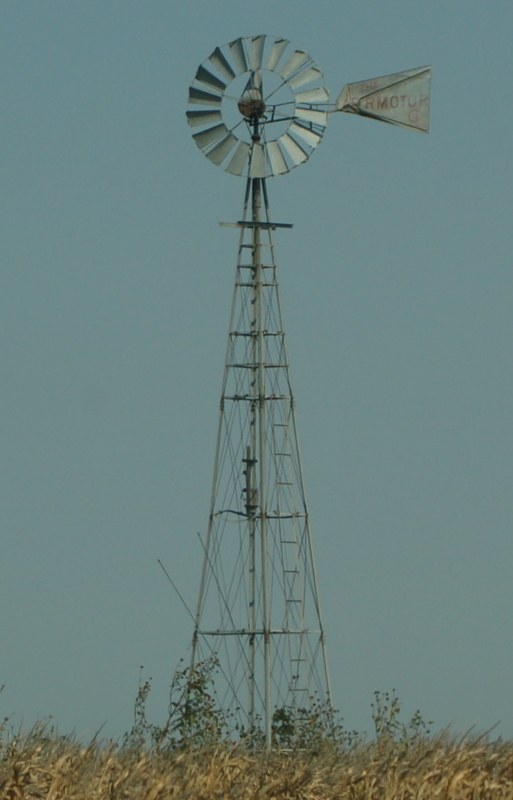 Windmills are common sites on Midwestern farmland. He decides to build a windmill, to give his family electricity and later a water pump so they can irrigate crops. He doesn’t have any money, though, so finding the parts he needs is challenging. He heads to the scrapyard and little by little collects all the pieces he needs. I’m not generally a lover of nonfiction, and certainly not nonfiction about scientific achievements. But this book is amazing. The Boy Who Harnessed the Wind is inspiring, hopeful, authentic. While I’ve never visited Malawi, some of the aspects of how it’s depicted reminded me strongly of my time in Cameroon. The writing is lovely. I was transported. A great story, a great book. Besides that, it’s a quick read. I wish everyone would read The Boy Who Harnessed the Wind (and this is something I say only very rarely). Kamkwamba’s blog and Mealer’s website.